Make no mistake about it, Italians love their bacon as much as Americans! You will often see them head out to their local butcher and stock up, especially if they’re making some of their favorite dishes such as bucatini all‘amatriciana or spaghetti alla carbonara. There is one key ingredient to such loved Italian dishes – pork fat! But not just any pork fat, but pancetta and guanciale – 2 cuts of pork which are not to be confused with beloved bacon. Italians are serious about their food, so don’t make the mistake of thinking bacon, guanciale and pancetta are one and the same. They are not. Here’s a brief guide to guanciale vs pancetta vs bacon! The breakfast staple that Americans are used to is a bit uncommon in Italy. Bacon can come from several areas of the pig. 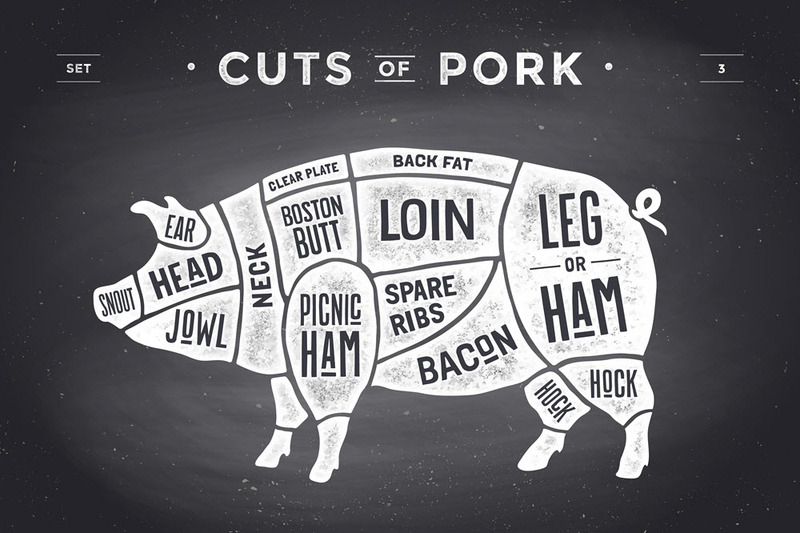 Lean cuts are from the back, while meatier cuts are taken from the side of the pig or the belly. Belly meat is streaked with fat, and when it’s fried it curls up and turns delectably crispy. In the United States, it is specifically the cured meat from the pig’s belly. 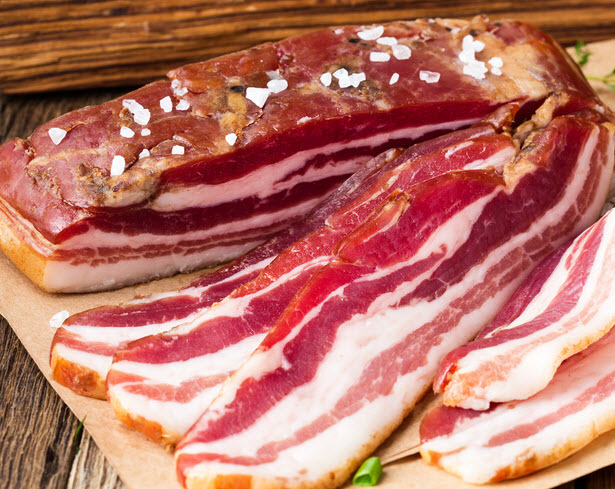 Italians make another type of cured meat from pork belly. Bacon is a pork meat which can come either from the back of the pig or from pig belly. Bacon pork meat is not only cured, but very often smoked. It’s usually cold smoked, which means it’s still raw after the process. A shopper can tell whether it’s been smoked by the condition of the flesh and the rind if it’s left on. If it’s been smoked, the rind is deep gold, and the flesh is deep pink. If it is unsmoked, the rind is white or cream-colored and the flesh is pale pink. Unsmoked or “green” is hard to come by. How Bacon Is Used in Cooking? Of course, everything tastes better with this irreplaceable cured meat. It’s used to wrap around chicken livers, wrapped around shrimp and sardines and fried up and baked along with zucchini and Parmesan cheese, tomatoes and basil in a casserole. For many people, the only proper breakfast is one with one or two of crunchy, salty strips. Guanciale pork meat come from the jowl of the pig, and its devotees claim there is no substitute for it. It’s not very easily found in the United States for several reasons, one of which is that the FDA has banned all imports of this meat from Europe. Luckily, Canadian and American farmers are catching on to this succulent fat, ideal for cooking. Guanciale is a pork meat which comes from cheek of the pig. This delectable, robustly flavored meat is seasoned on the surface with salt, pepper, sage, rosemary and garlic. Seasoning may change region to region based on tradition and curing habits. It is then dried and aged for at least 3 months, a fundamental process which concentrates the flavors. Italians love their guanciale and for good reason – the fat lends marvelous flavor to any meal, most especially pasta dishes. The flavor is so strong that a little bit of the meat goes a long way in a meal. It’s famously found in spaghetti alla carbonara or bucatini all’amatriciana. Pancetta is sometimes substituted in its place, but this quite a point of contention for many Italians and if you dare do so in classic dishes like the ones mentioned, you’ll find yourself in a dinnertime debate having to defend your choice. How Is Guanciale Used in Cooking? Aside from the obvious dishes such as carbonara and amatriciana which have already been mentioned, guanciale is also used in dishes such as pasta and fava beans, pasta alla gricia, ‘nduja calabrese, strozzapreti, pecorino romano e guanciale, tagliatelle con guanciale e zucca. Pancetta pork meat comes from the belly of the pig, not unlike bacon, though bacon does not exclusively come from the same area. Pancetta is indeed more similar to bacon than is guanciale, but these two meats are cured and cut differently which makes them very different from each other. Pancetta is usually salted and depending on the recipe, various herbs can be part of the curing process. It is then aged for 20 days to 4 months, depending on the type of recipe, in a dry and cool place. 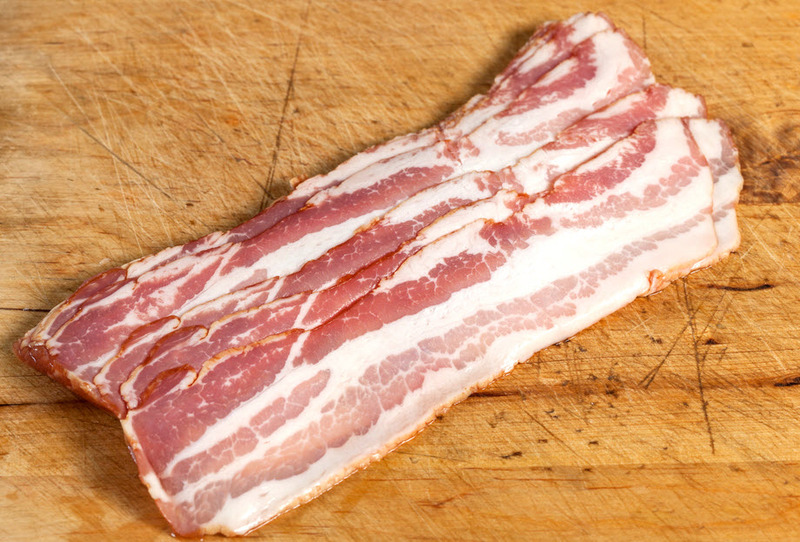 Pancetta is used for various purposes depending on the amount of time it is aged. It can also come in a smoked version. When rolled, or arrotolata it is served as is. The meat is sliced into paper-thin slices and eaten as an antipasto, and is mostly found in the north of Italy. How Is Pancetta Used in Cooking? Pancetta is quite a versatile ingredient in the kitchen and can add plenty of flavor to many a dish such as taglatelle ala ragù bianco, winter soups, pasta with asparagus and pancetta, pasta with pumpkin. So there you have it! The difference between guanciale, pancetta and bacon. Which have you used? 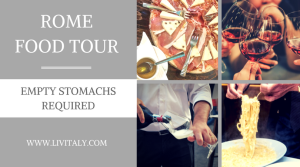 Book a Rome Food Tour & Taste Italy On Your Next Vacation! 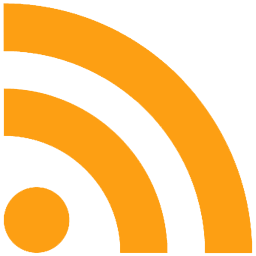 Thank you so much for sharing the great article. I found your blog very beneficial for me. Here, I found difference and how can i use pancetta. It will really helps me to find out the difference easily. As I live in America, Guanciale is new to me. I do know Pancetta, use it often. Bacon as well. I am an adventurous cook living in Los Angeles. I will check my local Italian markets for this product. 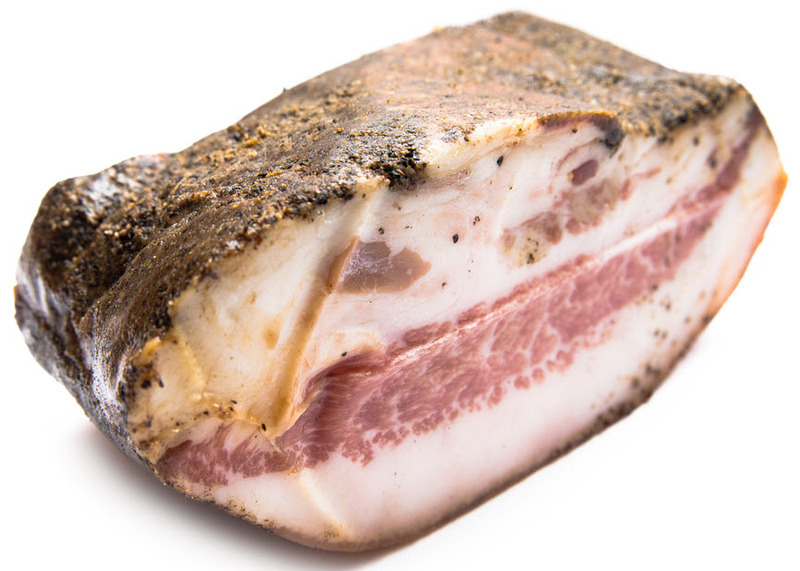 Guanciale is almost impossible to find and is only available in restaurants in Denver. Pancetta is no substitute and is also very difficult (but easier) to find. I’m thinking on giving up and replacing guanciale with bacon in recipes. In response to Frank from Colorado- I work at a shop in boulder called Cured, we sell guanciale! Don’t give up yet! I have bought guanciale from 3 different local sources in San Francisco and it is somewhat different from each. Now I am in Arizona for the winter and having to order it online but it seems as if there are plenty of sellers. I recently got some—about 1.5 lbs, enough for 4 batches of Amatriciana sauce—and plan to try it tomorrow but it looks and smells “right”. The source was a place called Olli.